There are rules! Well, a lot of modellers have struggled to define what makes for great track plans. Experience has shown there are many do's and don'ts. A passing track where two trains can go by each other. A minimum of one siding where you can park train cars. In combination with the passing track you can couple on to either end of the train car (rolling stock). For operation purposes this siding can be considered as an industry. Curves that are wide enough to take the equipment you want to run without derailments. This will vary with the scale you choose and the amount of space you have to work with. You are after three things. You want the cars to stay coupled. You don't want the wheels to come off the track. You want the coupled cars to look right. For example, if you have an 80-foot passenger car or auto-rack in HO scale and you are pulling them around an 18" radius curve they will overhang the curve and look very unrealistic. The couplers will deflect too far to the side and can pull the cars off the rails. The problem increases if you attempt to push the cars backwards. In N scale a similar problem happens with a 9" radius curve (N scale is half of HO scale for all intents and purposes while HO scale is half of O scale, hence Half O). A contributing factor to derailments in this situation is the weight of the freight or passenger cars you are trying to operate. If the cars are too light the chance of derailment increases. Prototype railroads are not immune. Often they super-elevate the outside rail on curves so that the cars lean inward. Model railroaders sometimes do this as well mainly for the visual effect although it can help if you pull really long trains. Minimize the amount of hidden trackage. Tunnels and hidden trackage for storage or "staging" can be useful to disguise track turning back on itself and to increase operation potential, but you know where the problem is going to occur! Deep in the tunnel or way back under the layout where you have to crawl on your hands and knees and reach into some barely accessible space to retrieve a derailed car. It also makes it difficult to clean the track for good electrical pickup. If you rely on rail joiners to conduct electricity, sooner or later one is going to work loose and fail. This can be hard to correct. Tip: If you have hidden trackage that must remain reachable, cut cardboard or masonite strips and attach them to the sides of the subroadbed so that they extend about an inch above the tops of the rails. In this way the cars are less likely to hit the floor if they becomes derailed and you can still reach them to either re-rail or retrieve them. Run your longest train car around the curve to be sure there is enough clearance. Don't just rely on the NMRA gauge as modern equipment may take up more space. Better to allow a little extra. We are all tempted to crowd in too much track. After all, it's a railroad we're building. That may serve at first, but sooner or later you will want to cover up that bare plywood. Try to keep the track several inches in from the edges to allow for scenery and the odd accident. A fence or a piece of plexiglass will help protect your trains if you must place the track close to the edge of the benchwork. Model train layout track plans often begin as 4 x 8-foot track plans in HO. That suggests the standard size for N scale should be 2 x 4-feet. In either case, that is not really the best size because, in HO scale, you really should aim for a "medium" radius of 24 inches, broader if possible. A 24" radius (using the center line of the track for planning) means that the track is going to hang over the edge of the 4-foot width. If you choose to use a smaller radius you will then have to consider restricting the length of your rolling stock and locomotives. Welcome to the world of scale model trains compromises! If you have the room, I'd suggest building two modular units 30 inches wide and, at least, 8 feet long. Tie them together side-by-side with carriage bolts. Make the longitudinal members in L-girder fashion, that is, glue and screw a 1" x 3" board on top of another 1" x 3" board to form an "L". You can then screw up into joists from beneath and always be able to move the screws should you need to install a switch machine or change the contours of the land above.I recommend using plywood benchwork for dimensional stability. If you don't have the tools (bench saw and someone to help you), have the lumber yard cut the plywood for you. Usually the first cut is free and you'll pay a few dollars for them to make the other cuts. You'll also end up with straighter edges. Use pine 2" x 2" for legs and set them back from the edges. See what we did for the Nottawasaga Club layout. Building the supporting benchwork this way has the advantage that if you have to move you can cut the rails with a Dremel cutting wheel where the track passes over the joints. If you run a backdrop divider down the layout lengthwise you can create two totally different scenes that cannot be seen together. This visually adds mileage to your railroad and keeps it more visually interesting. Carefully planned, the divider can serve the same purpose as a tunnel. You can have the track pass through a building or behind some trees in a cut to disguise the opening in the divider. When you're researching model railroad layout plans you will find many designed for 10 x 12-foot spaces or thereabouts. Why? Because that is a popular size for a spare bedroom. There are several factors to keep in mind whatever the space. Will you walk around the layout to get at all parts or will you walk into it? If you walk into it, do you need to orient it to contend with a doorway? Will it be a "U" shape or do you need to have a "duck under" or some kind of lift-out or swinging entrance. (I had a swinging entrance). How far can you reach? Normally you don't want to have to reach more than 30" into a scene and this will also depend on how high the layout is off the floor. Typically this is between 38" and 42" for a comfortable working height. A modeller who has contacted me has started a site for track plans. Check out track planning ideas by Alastair Lee. He also has structure tips for using paper cutouts. Model Railroader magazine has published many special issues about track planning and has annual issues about "Great Model Railroads". The National Model Railroad Association (NMRA) has a Special Interest Group (SIG) that discusses model train track plans. The Best of Model Railroading magazine's Track Plans edited by Robert Schleicher, ISBN: 0-9612692-0-0. Building Your Next Model Railroad by Robert Schleicher, ISBN: 0-9612692-2-7. Walkaround Model Railroad Track Plans by Don Mitchell, Kalmbach Books ISBN: 0-89024-081-7 This Model Railroad Handbook #15 contains the railroad on which my Utopia Northern was based, the Rock Point &: Coast RR. Track Planning Ideas from Model Railroader, 58 track plans from past issues, selected by Bob Hayden, Kalmbach Books, ISBN: 0-89024-555-X. 101 Track Plans, by Linn H. Westcott, Kalmbach Books. 101 Track Plans is an old soft cover book first published in 1956. I have the ninth printing from 1974. No ISBN number is listed. It may be hard to find. I mention it because the Appendix contains an all gauge track planning template. Before I used CADRail computer software for designing, I used a compass and protractor set, pencil and eraser to draw my plans. With the template you could draw TT plans to 1" scale, HO to 3/4" scale, S to 1/2" scale and O to 3/8" scale. As I was drawing for H0 I could use a standard ruler with 1/16" marking and use 12 x 1/16" (ie, 3/4") = 1 foot. Really convenient. The template had curves to keep proper separation to avoid side-swiping and simple and compound ladder tracks for yards. I used the template with tracing paper that I would slide over the template to draw in the parts I wanted. The other side of the sheet listed rolling stock suitable for operation on both conventional (medium) and broad curves, turnout dimensions, and data for locating #6 and #4 turnouts (switches). 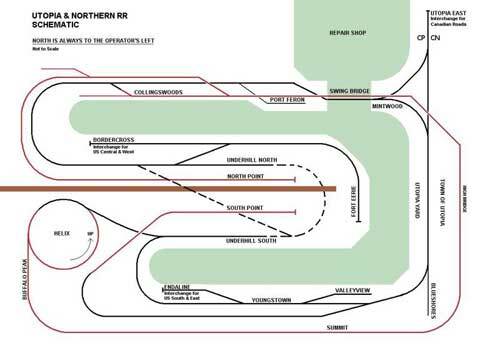 One of the track plans included (#8) was a shelf layout called the Port Ogden & Northern RR. It formed the basis of two modules that survived three moves of the Utopia Northern. My sections comprised Shaneville (named for my son) and Port Feron (after my wife's family). My track layout wasn't exactly the same as my modules are a combination of HO and HON3 with considerable dual gauge track work. The scenery was also different, but the essential switchback concept was incorporated. This layout track plan is a narrow bookshelf type so it doesn't use a lot of width in a room. It lasted until 2014 when I had to dismantle that layout. There's not enough room in the new UNRR under construction. Another similar idea is presented by Bob Hayden as a continuation of the Rock Point & Coast RR. He called it the Bay Head & Western RR, Bookshelf Division. II wasconsidering adding his track plan above Port Feron and below the G scale layout that resided above but I ran out of space. My G scale will move outdoors at the new house when I have time to tackle that project. At the end of the day it is your railroad and your concept. Is this your first attempt or your latest now-I-know-better layout? Will you follow a specific favorite prototype railroad? Will you build a freelance railroad that might have been? Will it be summer? Autumn? 1920, 1956 or 2008? Or will it just take on a life of its own as you build it? If you'd like to read about some terrific model railroads for free, subscribe to the online magazine Model Railroad Hobbyist. I have nothing to do with the magazine. This is a free plug. You can view all the archived issues going back to 2009. There's lots of inspiration for you and many "how-to" articles. Model Railroader magazine also has a database of hundreds of their trackplans that you can access if you're a subscriber. Back in April, 2011 I received an email from Milen Peev in Bulgaria. He is a railway enthusiast who has developed track planning software and is offering it free. I haven't tried it but I did have a look at his site. It looked really interesting. If you should try it, send me an email through my Contact Me page and let me know what you think. Here's the internet address: SCARM which stands for Simple Computer Aided Railway Modeller. Note: (Sept, 2013): Martin Alborough, a member of our Nottawasaga Model Railway Club has been using SCARM to design his N scale layout and really likes the program. He says it is easy to work with. Milen works in TT gauge, a gauge that's slightly larger than N scale and competed for modellers back in the 50s and early 60s. According to Milen it's still popular in parts of Europe, especially with scratchbuilders. There aren't a lot of TT scale modellers or manufacturers in North America. You can check out his personal website at Milen's website. If you are using a Mac and want to design your trackplan, friend John Houghton has high regard for Rail Modeller. It isn't completely free but he reports it is excellent trackplanning software for the Mac and has a very comprehensive library of track components. The software program is shareware from MacRailSoft which means you can download a trial version for free and decide later if it fits your needs before buying it. I downloaded it but found it difficly to use. Maybe I'm just not as smart as John. Go for it. Have fun designing your track plans. Happy railroading. Go from "track-plans" to my My Model Railroad, the UNRR. Return from "track-plans" to my Home Page.